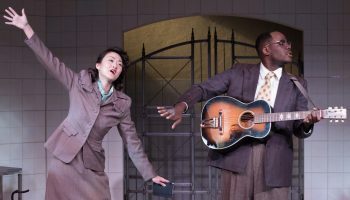 This past Saturday, Rogue Machine opened British playwright Tom Morton-Smith’s hit Royal Shakespeare Company play Oppenheimer, and the occasion was a cause for celebration on several fronts. It marked the company’s move to an inviting new address: The Electric Lodge in Venice. And after 11 years of nomadic uncertainty, the company had found what it expects to be a permanent home. But above all, what demands celebration in this company’s re-launch is the inaugural production it has delivered. 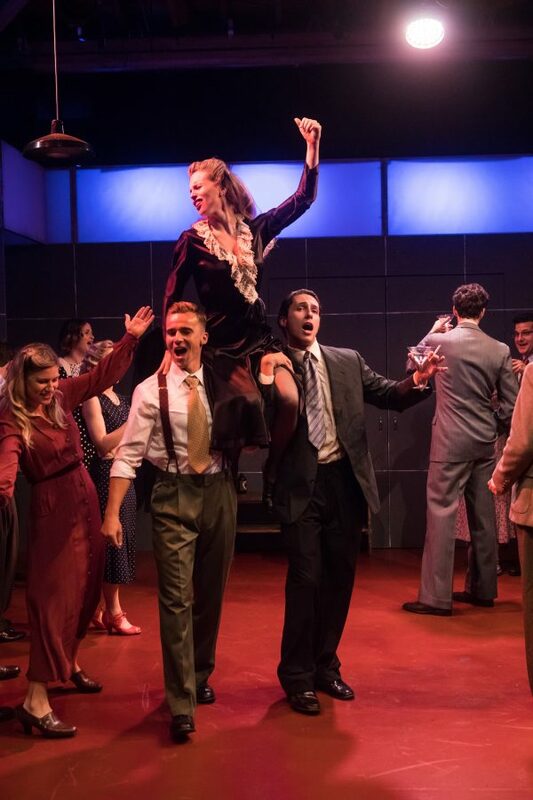 Its American premiere of Oppenheimer is a vibrant experience on pretty much every level. 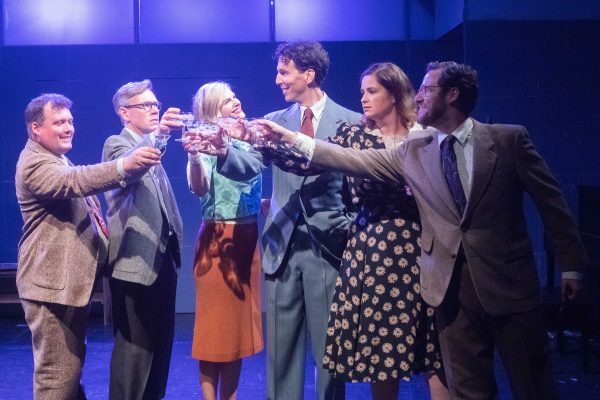 Outwardly, this is a play about American physicist J. Robert Oppenheimer, the so-called father of the atom bomb, that digs deeper (and wider) not just into the science and politics of the time, but also into the character and often contradictory life of the man. It surreptitiously examines his maverick propensities, along with those of the people around him, wives and lovers included. 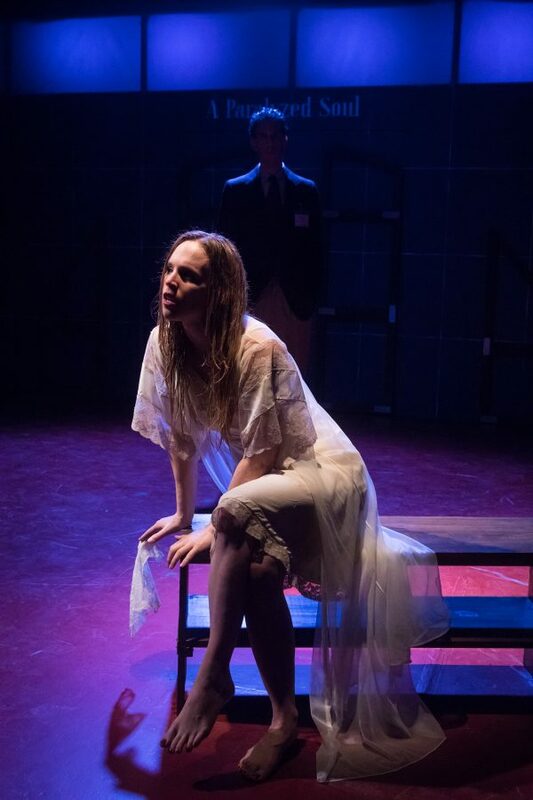 The play starts out innocently enough, in the late 1920s or early 30s with the youthful partying of this close-knit group of students enthralled by science, seduced by communist ideology, smoking and drinking their way into adulthood with a certainty and optimism that can’t last. But while the enthusiasms will fade and separate them, the science will unite as many among them and determine their paths to maturity in ways they could hardly have suspected at the outset. As the action unspools, it captivates with the variable mood — and ethics — of the policies pursued (sometimes blindly) and the ultimately radioactive emotional fallout for everyone involved. As dramaturgy, Morton-Smith’s Oppenheimer is not without flaws, but perfection is not entirely what it’s chasing. 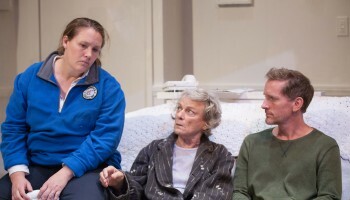 The ambivalent humanity at the core of this play about science is what grabs our attention. 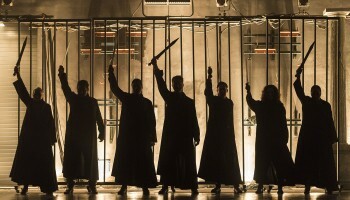 The production is almost three hours long. It has what feel like more than one ending, some of them anti-climactic, and a couple of dead spots in the middle, including a short barroom scene that could be dispensed with and never be missed. Yet the fast pace of the narrative and intimate examination of character never lose their audience. Artistic Director John Perrin Flynn’s limber and frequently playful staging is responsible for it all. Within the naked confines of a square room with five exits, he finds ways to move the language-heavy three hours without rushing them, and to physically demonstrate some of the science by having its nucleus of young eggheads horsing around with camaraderie and each other, even as they are only just beginning to understand the enormity of what they have uncovered. Not much later, after the rolling out of the bomb and its initial explosion, we watch them descend into primitive whoops and a savage dance of deliverance — or death — choreographed by Marwa Bernstein, revealing all the horror in the triumph of that spectacle. l-r, Michael Redfield, Dan Via, Rachel Avery, James Liebman, Jennifer Pollono, & Mark Jacobson in Oppenheimer at Rogue Machine. It’s a big cast, too. Two dozen knowledgeable actors on stage, some doubling into even more characters, keep things aloft. Flynn picked them with care and nowhere does that pay off more handsomely than in James Liebman’s “Oppie.” The complexity of his performance in that title role is distinguished by a kind of reticence and grace, a reluctance to shine and take center stage amid the noise — which is exactly right. He has the tall and thin demeanor of the enigmatic man he impersonates — a creature apart, sometimes cruel, with a perpetual question mark in eyes that seem always to be looking Beyond. Others worthy of special mention in a uniformly capable ensemble are Rachel Avery who makes the role of Oppenheimer’s difficult wife Kitty both insistently difficult and surprisingly engaging; Kirsten Kollender is the fragile and needy lover; the exceptional Ron Bottitta as General Leslie Groves, is the skeptical yet admiring military head of the Project who won’t let that subversive man of science overwhelm orderly process, and Ryan Brophy, as Robert’s clear-eyed and outspoken brother Frank, emerges as unafraid to articulate his firmly opposing convictions. In the foreground Kirsten Kollender, in the shadows James Liebman, in Oppenheimer at Rogue Machine. Stephanie Kerley Schwartz’s simple design utilizes minimal furnishings in a room already overfilled with bodies. She is aided by the projections of Nicholas E. Santiago assisted by Michelle Hanzelova. Sound designer Christopher Moscatello and lighting by Matt Richter create the ambience, as well as the A-bomb explosion. Costumer Diane K. Graebner keeps everybody dressed in the appropriate 1930s and 40s styles, which includes securing the right props, such as those period protective goggles onlookers had to wear at the bomb site. Ultimately, the production’s unimpeded flow, Brechtian overtones, smart choices and the play’s deep dive into the complicated man who said he needed physics more than he needed friends, prove irresistible. It’s a thrilling ride. Top image: Clockwise from left, Mark Jacobson, Kenney Selvey, James Liebman, Brewster Parsons and Zachary Grant in Oppenheimer at Rogue Machine. WHERE: Rogue Machine at the Electric Lodge, 1416 Electric Ave., Venice, CA 90291. WHEN: 8pm Saturdays & Mondays, 3pm Sundays, through Dec 30. ADDED performances: Fridays 10/26 & 11/2, 8pm. Sunday 10/28, 8pm. NO performances Sunday 10/28 at 3pm, 11/12,17, 26 or 12/1, 2, 8, 9,10 or 24. HOW: Tickets, $40, available at www.roguemachinetheatre.com or by calling 855.585.5185.